Great screenprinting starts with a great garment. Ballin on a budget! For a straightforward tee that won't break the bank, try the Gildan 8000. 50/50 cotton & polyester blend that's sturdy enough for the jobsite and cheap enough for the raffle. The 3600 is the 100% cotton version of our favorite tee. Lightweight, comfy cotton in a tailored fit. With an accessible price point and a consistent, modern fit, the 3600 is a great tee. The 6610 is the sister version of our favorite tee. Lightweight, comfy cotton in a feminine fit. A great ladies' tee at an accessible price point. With the same great fit and quality as the 3600 and 6210, the 6010 is Next Level's unisex tri-blend tee. Comfort comes at a price, but it doesn't get softer than this. When it comes to Made In USA, American Apparel sets the standard and sets it high. The 2001 is their flagship unisex cotton teen and doesn't disappoint. Soft cotton in a classic American Apparel fit. 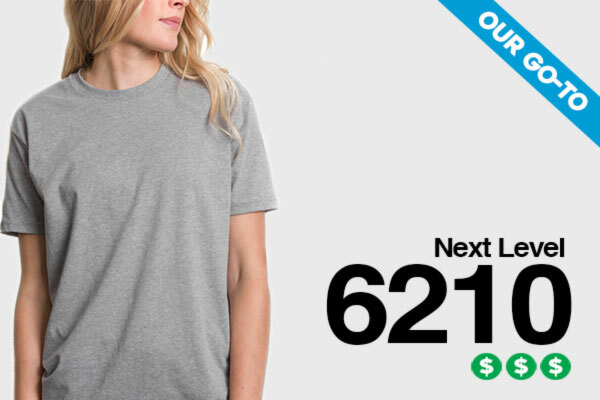 For a premium unisex tee at a great price-point, the 6210 is our go-to. It's made from a super soft, 60/40 cotton & polyester blend in a tailored, modern fit making it a great tee for almost every application. Bella Canvas makes a retail-ready product at an accessible price point. With polyester blend options and every color known to man, the 3001 is a unisex tee great for retail & branding. The 6004 is the sister version of BC's 3001. Lightweight, comfy cotton in a feminine fit. With a ton of color options and Made In USA options, the 6004 doesn't disappoint. The pinnacle of pocket tees. With a fashion-forward fit and lightweight all-cotton and cotton/poly blends, the 3021 is our go-to pocket tee. We love printing on these. Not only do they have a taller, tailored fit that we love, but they're Made In USA from organic cotton and recycled polyester, making the Royal 5051 our most people and planet-friendly tee. Ballin on a budget! For a bare bones, basic longsleeve, the Gildan 8400 is a great fit. Made from a sturdy, 50/50 cotton & polyester blend. An American athletics classic! To take your softball, kickball, [insert any beer sport] uniform to the next level; get on board with the Champion T137. You work hard. You need a longsleeve pocket tee that can keep up with you. Here it is. The Gildan 2410 is made from a heavyweight cotton that can tackle any job. With a wide variety of fabric blends and colors, the Bella Canvas is our go-to for a premium longsleeve tee. For those who know, tri-blend is synonymous with soft. The 6051 is a tri-blend 3/4 sleeve tee that's great for applications from retail to sleepwear. Maybe you're outfitting 200 middle schoolers or employees on a shoestring budget. Maybe you just have an inside joke worthy of a sweatshirt. If you're looking for an affordable crewneck, go with the Gildan 18000. The Independent AFX90 is a lightweight zipper hoodie with a great unisex fit. Available in some great colors at an accessible price point, it's our go-to zipper hoodie. Tired of boxy hoodies that ride up at the bottom? Us too. That's why the Independent 4000 is our go-to pullover a hoodie. It's a premium, heavyweight hoodie with a slightly taller fit and some cool color options. Need an affordable hoodie to give to your crew? Looking for a promo hoodie to give away? If you need an affordable hoodie you don't feel bad about giving away or getting dirty, the price is right on the Gildan 18500. For that classic crewneck look, check out the Independent 3000. This baby is well-made from cotton & polyester blend that won't ride up at the bottom. This is Independent Trading Company's raglan sweatshirt. Think baseball tee meets sweatshirt (the difference is in the sleeves). For a great quality, midweight sweatshirt with a little twist, the 30RC is great. Hey ladies... looking for a racerback tank woven from magical clouds? Yup, we have those. Check out the Next Level 6733 tri-blend tank for ultimate softness. Does "bro-tank" ring a bell? For a soft cotton in everyone's favorite class tank top style, make the Next Level 3633 your tank, bro. For a flowy, retail-ready ladies' tank top with some funky color options, look no further!